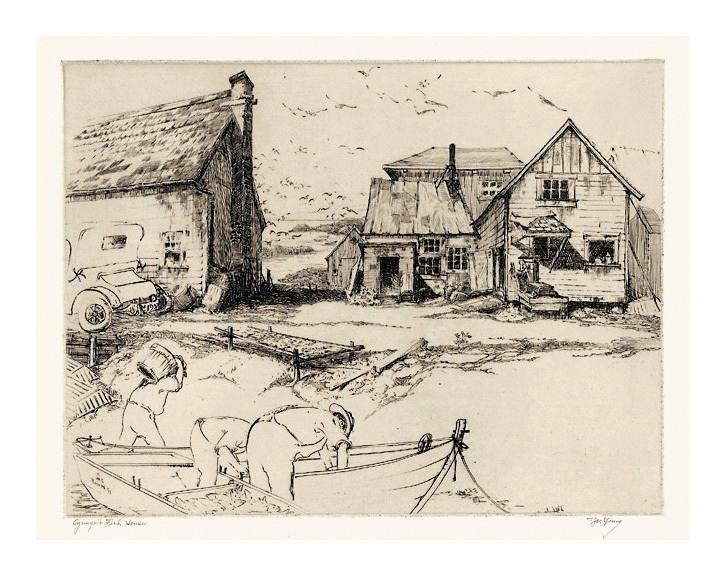 Ogunquit Fish Houses = 1927, Etching. Image size 8 7/8 x 11 3/4 inches (225 x 298 mm); sheet size 12 5/8 x 16 1/2 inches (321 x 419 mm). A superb impression with rich burr throughout, on cream laid paper; full margins (1 1/2 to 2 1/2 inches), in excellent condition. Ex. collection Kennedy Galleries, with the original gallery mat. 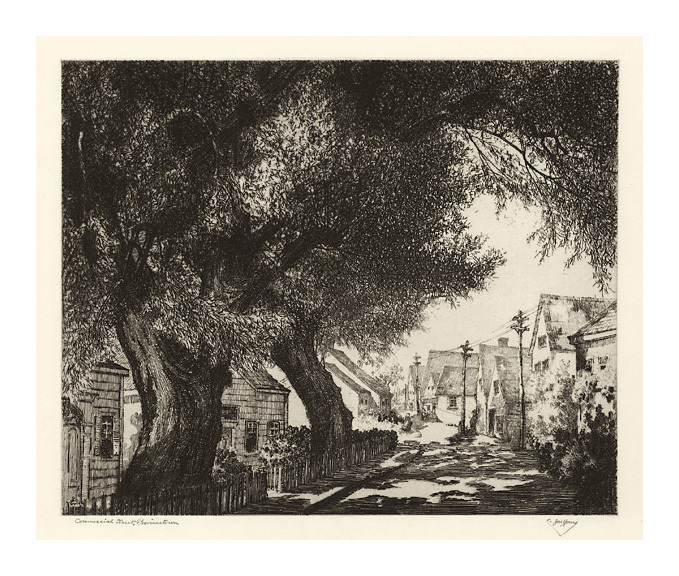 Commercial Street, Provincetown = 1928, Etching. Image size 9 3/4 x 11 13/16 inches (248 x 300 mm); sheet size 13 7/8 x 18 inches (352 x 457 mm). 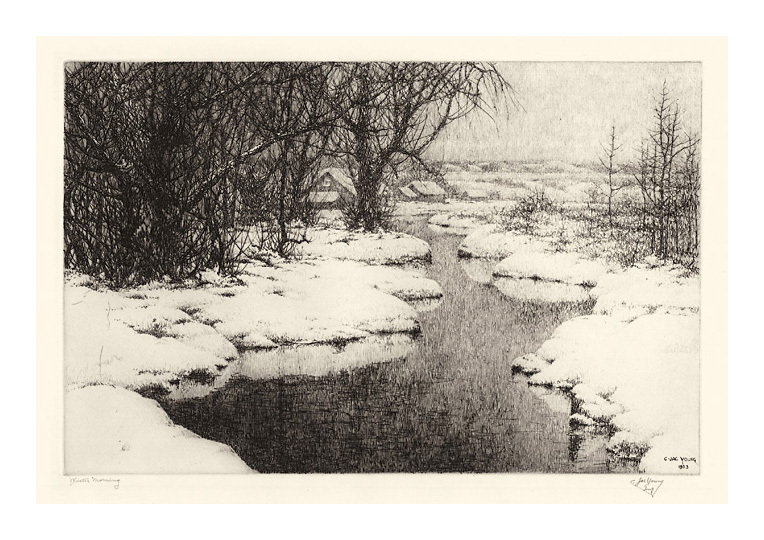 A superb impression with rich burr throughout, on cream wove paper; full margins (1 5/8 to 3 1/8 inches), in excellent condition. 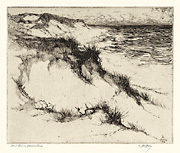 Sand Dunes, Provincetown = 1928, Etching. Image size 6 3/8 x 7 7/8 inches (162 x 200 mm); sheet size 9 3/8 x 13 1/8 inches (238 x 333 mm). A superb impression with rich burr throughout, on cream laid paper; full margins (1 3/8 to 2 3/4 inches), in excellent condition. 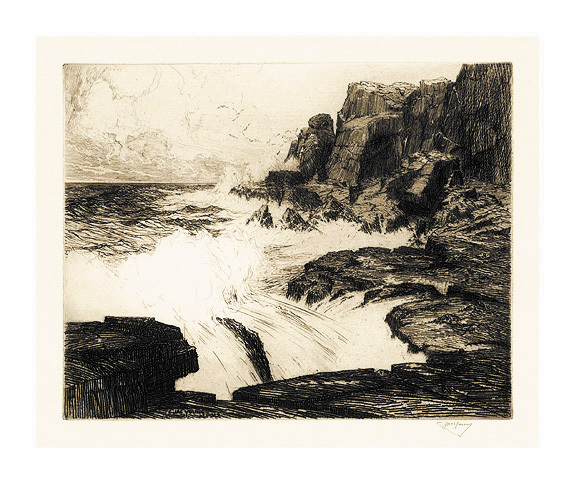 Surf-Pounded Coast = 1929, Etching. LC 2. Edition not stated. Signed in pencil. Signed and dated in the plate, lower left. Image size 7 13/16 x 9 7/8 inches (198 x 251 mm); sheet size 10 1/4 x 13 inches (260 x 330 mm). A superb impression, with skillfully controlled overall platetone, on Arches cream laid paper; full margins (1 1/8 to 1 5/8 inch), in excellent condition. Published by the Brooklyn Society of Etchers, 1929. Collection: LC. 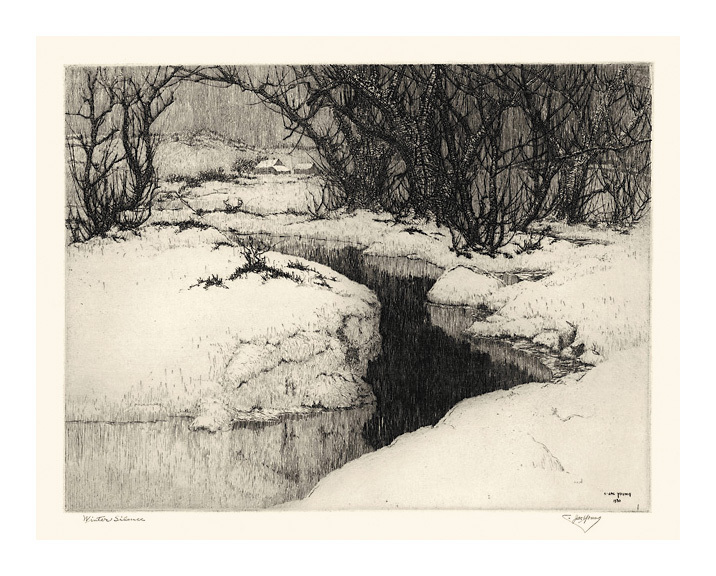 Winter Silence = 1930, Etching. Edition not stated. Signed and titled in pencil. Signed and dated in the plate, lower right. Image size 8 13/16 x 11 3/4 inches (224 x 298 mm); sheet size 13 1/16 x 16 inches (332 x 406 mm). A superb impression with rich burr throughout, on cream wove paper; full margins (2 to 2 1/4 inches), in excellent condition. Image size 8 3/4 x 11 3/4 inches (222 x 298 mm); sheet size 13 1/2 x 17 1/8 inches (343 x 435 mm). A superb impression with rich burr throughout, on cream wove paper; full margins (2 1/8 to 2 13/16 inches), in excellent condition. 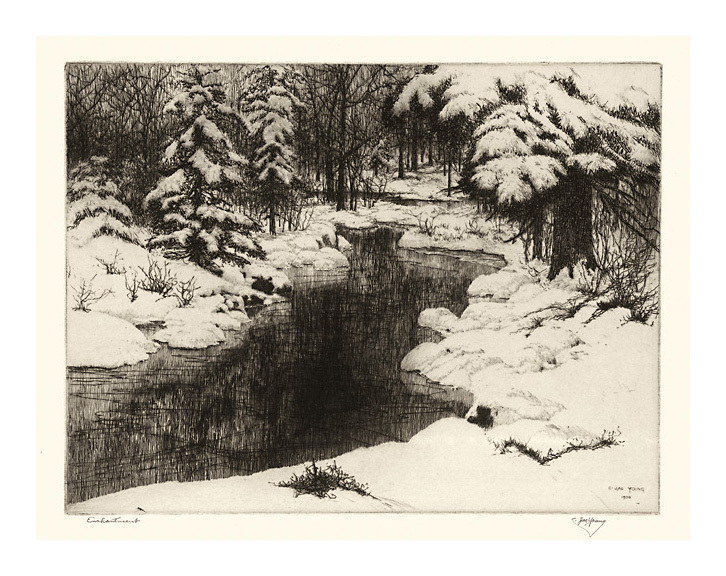 Winter Morning = 1933, Etching. Image size 8 13/16 x 13 3/4 inches (224 x 349 mm); sheet size 13 3/4 x 18 5/8 inches (349 x 473 mm). 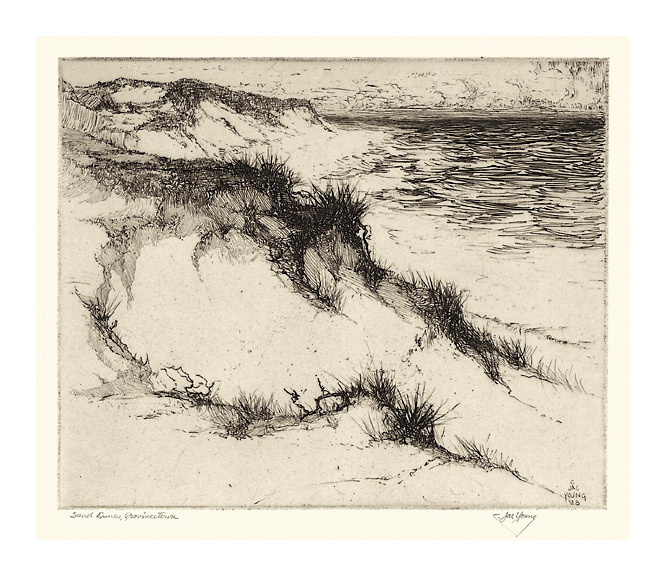 A superb impression with rich burr throughout, on cream wove paper; full margins (2 3/8 to 2 7/16 inches). Glue rermains inn the top right sheet corner, recto; minor toning in the bottom left sheet corner, recto; both well away from the image, otherwise in excellent condition. Printed by the artist.